Description: For the first time ever, Canada''s best loved author and illustrator team creates a festive story to ring in the holiday season - with all of the zaniness fans have come to expect, of course! Every year Julie finds the Christmas presents her parents hid: in the basement, under the bed, in the garage. But this year it''s Christmas Eve and she has found nothing. NOTHING! She''s worried - will be there no presents at all? Her investigation takes her to a mysterious box on the rooftop, which - lo and behold - houses all of the gifts! 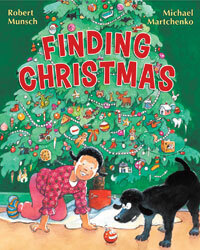 But, in classic Munsch mayhem, she becomes trapped inside, creating the biggest surprise of all for her family on Christmas morning. Jake's Review: Munsch books are so much fun to read even for big kids like me. 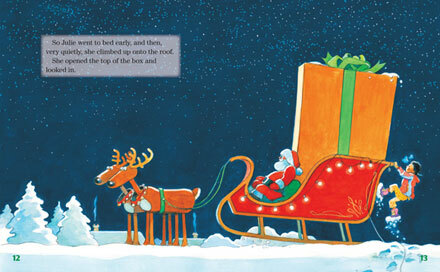 It's also cool that its not all mushy like most of the Christmas books usually are. I will definitely read this to the little midget at bedtime. This book would be really good for little kids cuz Munsch's writing sounds like a little kid talking. I like how fun the drawings are and each time you look at it you see something different. The pictures are really funny and even kids my age will like them. I think mom also likes this one because she is always telling me to stop looking for presents and to just be patient. Wish the book was longer.